Like many of you, I love my Keurig machine. Knowing that I can go downstairs and have a yummy, warm beverage in my hands in about 30 seconds is sometimes the only thing that gets me out of bed in the mornings! However, I do NOT love storing all of those pesky little cups. We have a “beverage station” in the cupboard above our Keurig that is filled with mugs, teas, hot cocoa, and additional k-cups. I also have pretty white urns next to our Keurig which hide my favorite flavors of the moment. You can see them pictured below. And then in the pantry (oh yes there is more) I store our “in bulk” k-cups in a basket. This system is working okay for us, but my husband and I both agree that there is probably a better way to store and organize k-cups than a 3-tiered system! 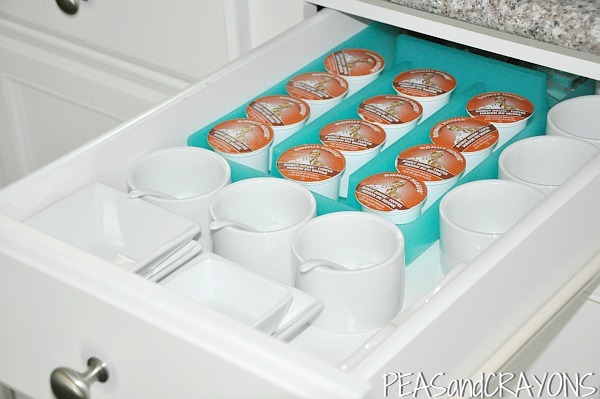 Today we will explore some creative k-cup organizers and storage systems that are working well for others! First up, we have a picture I found on Pinterest from an unknown original source. It appears to be an old printer’s tray used for k-cup storage. 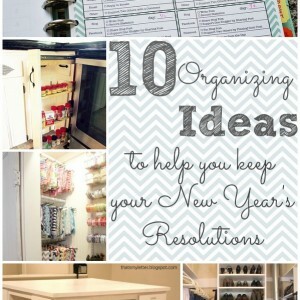 I love this idea and actually own a printer’s tray! It’s currently hanging in my dining room and is filled with shells. Maybe I’ll pop out those shells and replace them with some good ‘ole caffeine 😉 . 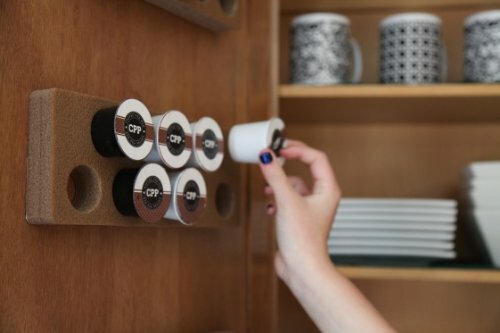 I’m not a huge fan of seeing the k-cups on my counter, but this storage solution is cute enough that I might not mind. I would definitely use this idea when entertaining. It’s great for guests to easily see at a glance your different flavor options. Allison from Two Thirty-Five Designs used superglue and dowel rods in a spare drawer to create a $2 DIY K-cup Organizer. If you can spare a drawer, this is a brilliant storage idea! For a less permanent solution, silverware trays also work well in a spare drawer. I like how Peas and Crayons also has her mugs ready to go in the same drawer. I don’t know who Lazy Susan was (and I feel kind of bad for her being immortalized as “lazy”), but she was clearly a flipping genius. Organizers everywhere owe her a debt of gratitude! Carmel from Our Fifth House cleverly came up with this Lazy Susan K-Cup Organization Station that is housed in her beverage cupboard. All of her little pails are clearly labeled and she can just give it a spin to see what flavor she’s in the mood for. Since I too have a beverage cupboard, I might need to add this idea to my bag of organizing tricks. 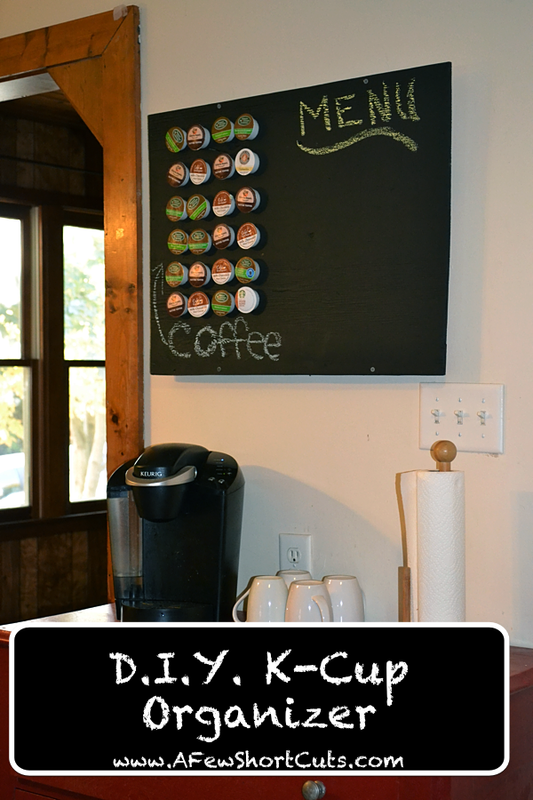 Here is another DIY K-Cup Organizer that is cute enough to be displayed! A Few Shortcuts created this organizer with a scrap piece of plywood, a circle drill bit, and some chalkboard paint. This would make a cute handmade gift! 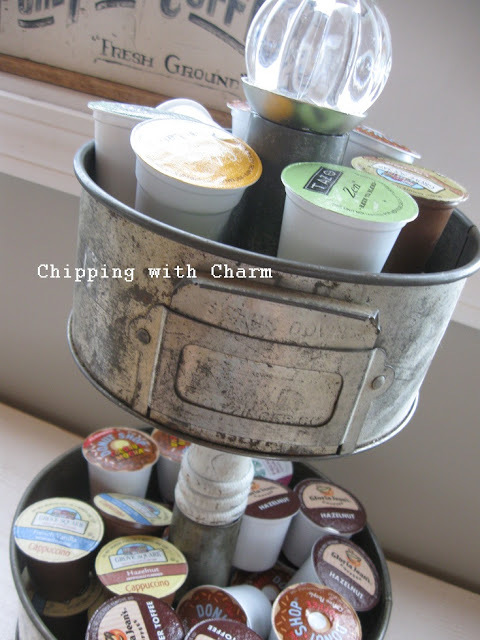 Chipping with Charm wanted a k-cup storage solution that matched her kitchen decor. 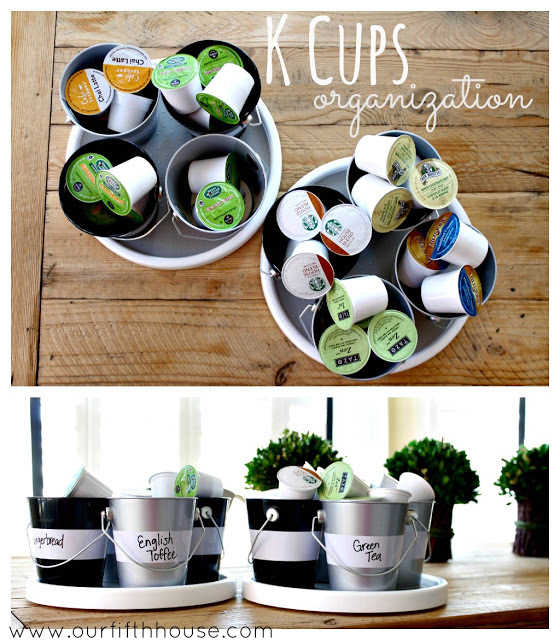 She used vintage cake pans, an old stool leg, and a curtain rod finial to create this unique DIY K-cup Tiered Stand. How clever! This tutorial for a DIY Cupboard Door K-cup Holder by In My Thirties is translated from Spanish (rather poorly by the Google translator gods) so it’s not entirely clear to me how she did it. She says something about using plastic tubing that is used to pull cables through the wall? I’m not sure what that would be but it looks like an ingenious idea! She glued this grooved tubing to the inside of her cupboard and slipped the k-cups (or in this case pods) into the tubing. 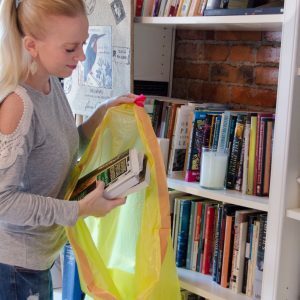 My cupboard shelves extend too far out for this idea to work properly but perhaps this idea will get your creative juices flowing! And of course if you don’t want to DIY a k-cup storage solution, you can buy a ready made one. I searched on Amazon for the ones I liked the best that didn’t cost a fortune. These are affiliate linked. 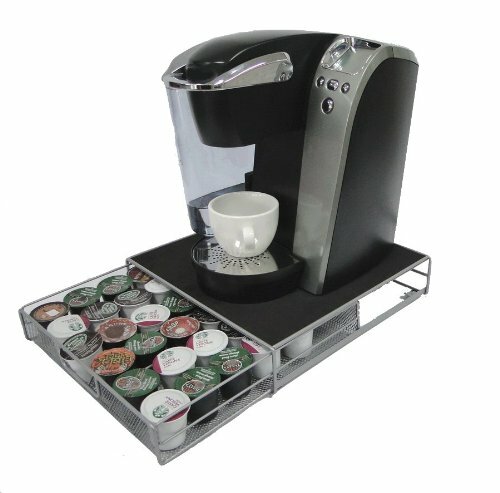 I’m not crazy about the carousel-type organizers, but I do like the k-cup drawers that slip underneath your machine. I like that this one has three cute little drawers. 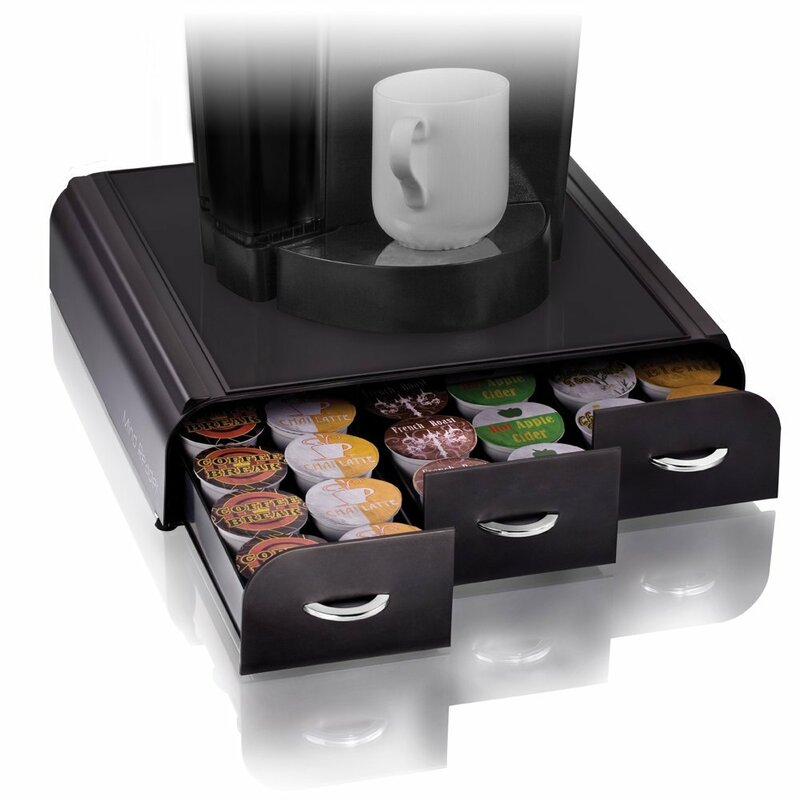 Here is another k-cup drawer organizer that received fantastic reviews. 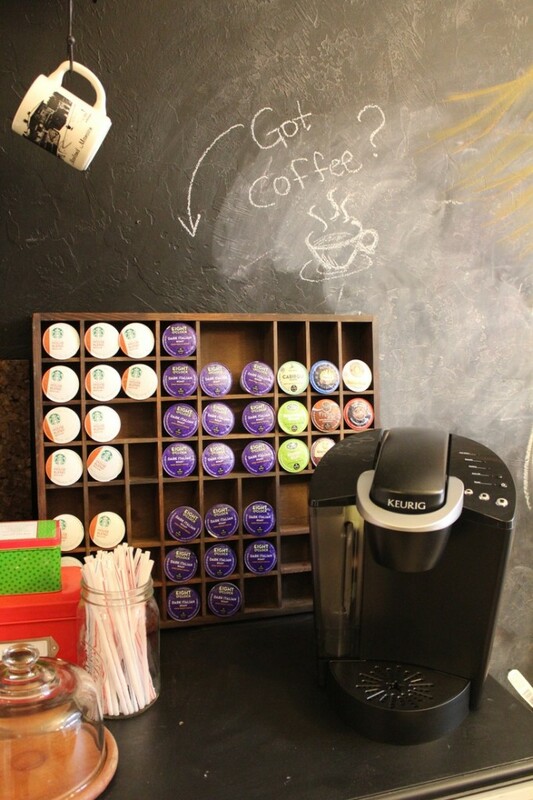 I thought this Foam Coffee Pod Pad Storage System is a great out-of-the-way storage solution! You can even attach the foam pads underneath a shelf so that the cups are hanging upside down. The reviews are very promising for this product. So how about you? 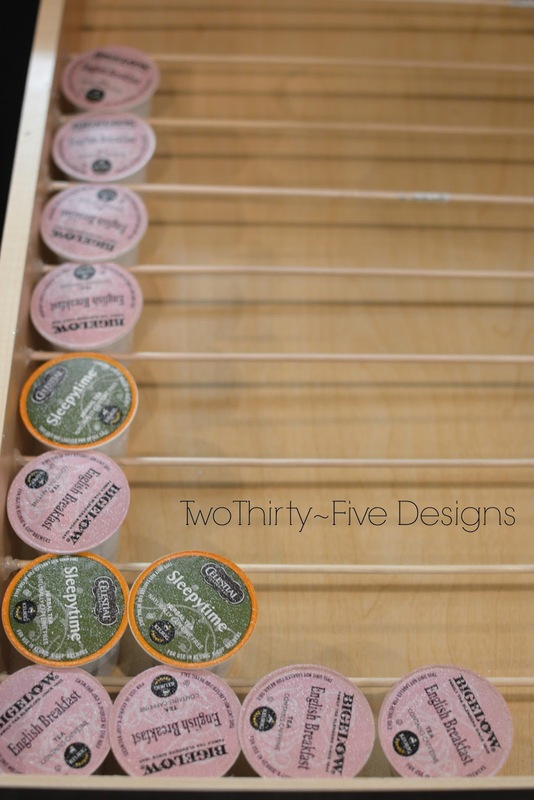 Do you have an ingenious way of storing all of those pesky k-cups? If so, I’d love to here about it! I think this self adhesive cable cover is the product that was used for the storage solution on the inside of the kitchen cabinet. 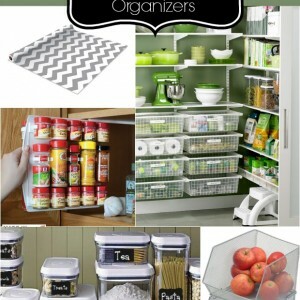 Oh I just love your kitchen and your organizational skills! 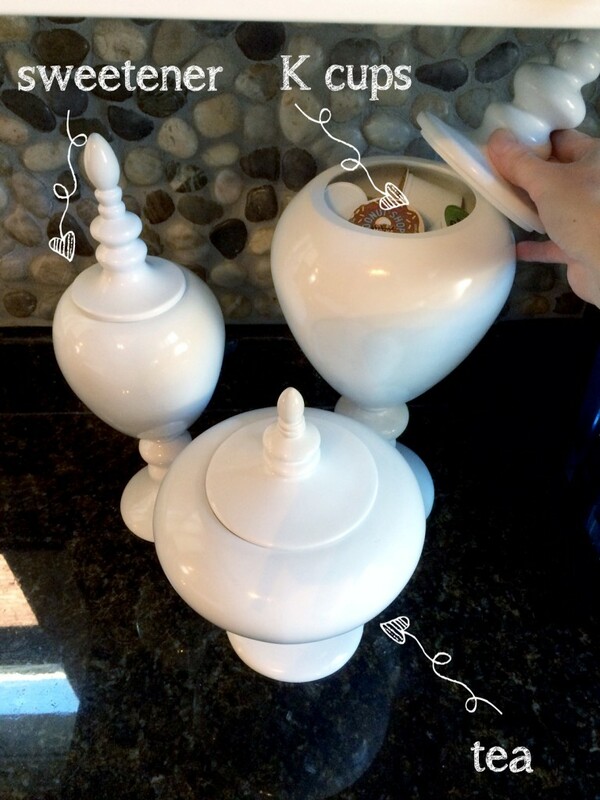 Where did you purchase the white lidded jars that hold the k cups, tea? Thank you! Thank you! I actually found those at Lowe’s of all places a few years ago. Im pretty sure Allison from Two Thirty-Five designs used my picture from pinterest. The one with spare drawer is my picture I posted in pinterest. I can provide my house pictures. Can you correct the info? Thank you!! OH! Im sorry I read it wrong!’m so silly it was for the next one lol delete my comments! lol Thanks for sharing my picture! I’d be happy to link back to your original post for this picture. Do you have a url where it is posted? I have a bamboo “box” under the keurig to store the k-cups. It’s great but the additional height on the counter-top can make it a challenge to put water in the top (for those of us with single cup reservoirs). I had a junk drawer underneath that I cleaned out as soon as i saw the two thirty-five designs photo. 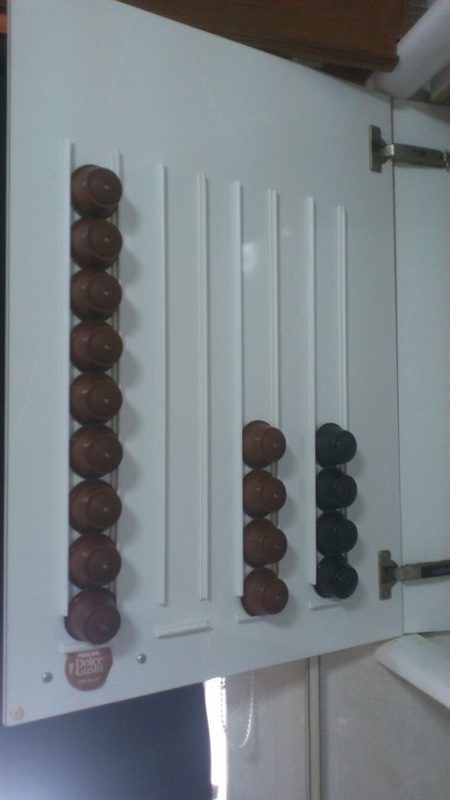 I didn’t use dowels but some short spring-loaded curtain rods instead. Not short enough to fit front to back but it works just as well side to side. It gives me room for more k-cups and gives me the clearance height I need for the Keurig. livelovediy.com showed k cups in a trifle bowl sitting on the counter. I don’t own a Keurig “yet”. My son has one and they use his grandma’s milk glass cookie jar. Great tribute to grandma and good camo for the K cups. I have an old wooden slide drawer (looks a bit like an old card catalog drawer only shallow and wide.) There are 10 sections inside that hold five cups each, and it fits under the machine if I want it to. Great ideas! I have found that the spice jar racks with the holes in them (can find them at any thrift store for around $2) works perfectly. I use the ones that is made on top of a lazy suzan and holds 20 K Cups. I was wondering if spice jar racks would work! Thanks for the tip. I loved them Laurel! 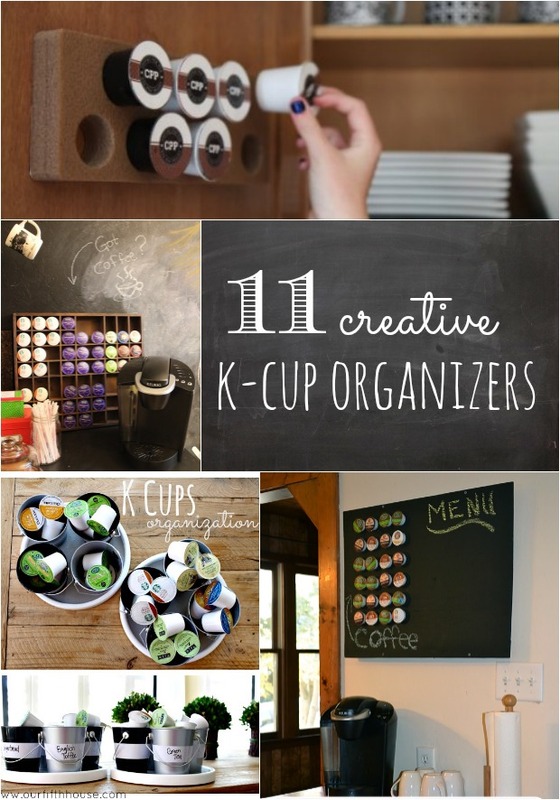 Such a great way to keep your own decor aesthetic while storing those k-cups. two small baskets in the cabinet above my machine. But I have a printers tray in my basement so tomorrow I must dig this up and see if they fit!! Dang, this is cool. I really like the one that is on the inside of the cupboard that would be hidden what it is put away. The drawers underneath the machine are awesome! What a great idea! Thank you for this! The many boxes of kcups sitting on my kitchen counter have been driving me crazy! We’re temporarily in a small apartment following a move (while we wait to sell our house in another state and before we can begin house-hunting in earnest in our new state) and space is definitely at a premium! I’m thinking those little trays that the Keurig sits upon (linked from Amazon) would work the best for me at this point. I love that printer’s tray, don’t know if we would have enough counter space for that though, perhaps for a smaller one. Though we do have a carousel tower, not the wire one but the black and silver type. It works for now, but everyone in the house is lazy about re-filling it from the extra k-cups that sit in the box! We buy them in bulk, so I would love something large enough, that drawer idea works too, but I don’t want to spare a drawer!! OK, now I’m rambling! !